Maximum support in the Pregnacare range for all of pregnancy. UK's no.1 pregnancy supplement brand. British no.1 supplements. The Queen's Awards for Enterprise: Innovation 2018. Free from lactose and yeast. Free from preservative & artificial colours. Pregnacare is not tested on animals. The ultimate support in the Pregnacare® range Pregnacare® Max offers the ultimate formula in the range for mums-to-be who want the maximum nutritional support from Pregnacare®. This advanced formula provides nutrients important during pregnancy. Including 400µg folic acid, incorporating the special, readily bioavailable form L-Methylfolate, together with other essential vitamins and minerals, including 10µg vitamin D, 500mg calcium, plus 300mg DHA. 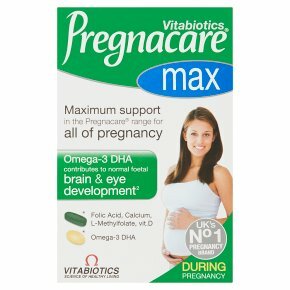 Pregnacare® Max tablets Carefully formulated by experts to provide nutritional support during pregnancy with: 400µg folic acid daily, the exact level recommended by the UK Department of Health, which contributes to maternal tissue growth during pregnancy. A daily intake of 10µg vitamin D as recommended by the UK Department of Health for all pregnant and breast-feeding women. Nutritional tablets produced in Britain to high GMP3 quality. High Purity Omega-3 capsules Research increasingly shows the importance of essential fatty acids in the development of babies and infants. Each capsule provides 300mg DHA (Docosahexaenoic Acid), the level recommended by international experts4 (ISSFAL). Maternal intake of DHA contributes to the normal development of the eye and brain of the feotus2. Fish oil produced to high GMP3 quality. Certified for sustainability by Friend of The Sea. 1. The pregnancy supplement brand midwives recommend most. 2. A beneficial effect is obtained with a daily intake of 200mg DHA in addition to the recommended daily intake of omega-3 fatty acids for adults. 3. Good Manufacturing Practice. 4. Journal of the American College of Nutrition, Vol. 18, No. 5, 487-489 (1999). The ultimate pregnancy support in the Pregnacare® range Comprehensive formula Special nutritional support with L-Methylfolate, a readily bioavailable form of folic acid. Recommended levels Provides the UK Department of Health daily recommended levels of 400µg folic acid and 10µg vitamin D. Brain & eye development With 300mg DHA to contribute to normal foetal brain and eye development2. Bone healthy Includes 500mg calcium plus vitamin D and magnesium to help maintain normal bones. Blood formation With iron and vitamin B6 & B12 to contribute to normal red blood cell formation. Plus calcium and vitamin K which contribute to normal blood clotting. Unique range of nutrients Wide range of micro-nutrients including Inositol, L-Arginine and Natural Mixed Carotenoids. Directions Two (2) Pregnacare® Max tablets per day, plus one (1) omega-3 capsule per day, with your main meal. Swallow with water or a cold drink. Not to be chewed. Do not exceed recommended intake. To be taken only on a full stomach. You can start taking Pregnacare® Max at any point during pregnancy. This comprehensive formula replaces other Pregnacare® multivitamins. There is no need to taken an additional multivitamin. FOOD SUPPLEMENT<br>Food supplements must not replace a varied and balanced diet and a healthy lifestyle.<br>As with other food supplements, consult your doctor or pharmacist before using if you are under medical supervision, have epilepsy, a thyroid condition, haemochromatosis, suffer from food allergies, or are allergic to any of the ingredients. Contains high purity fish oil.<br><br>As Pregnacare® contains vitamin K, if you are taking oral anticoagulants (e.g. warfrain) do not take Pregnacare® except on the advice of a doctor.<br><br>This product contains iron, which if taken in excess, may be harmful to very young children.